Urban office locations are the new employee perk. In Forbes Magazine’s 2013 list of the best American cities for business, the No.1 ranked city is not San Francisco, New York, or Washington, D.C.: It is Des Moines, Iowa. Provo, Utah, is No.2 and Raleigh, N.C., is No.3 — both tech-centered cities in states with exceptionally business-friendly conditions. Nashville, Tenn., and Denver take the fifth and six slots, with Salt Lake City coming in at No.12 and Charlotte, N.C., at No.19. The attraction of these secondary cities is not only economics but also their renewed and re-energized urban cores. Companies of all sizes are seeking locations that offer access to transit, mixed-use amenities, and overall convenience. Technology-driven flexible work days have created a demand for access to restaurants, entertainment, other people, and especially public transportation. Businesses now strive to offer an environment that keeps their employees within the office area to increase productivity and ultimately bottom-line results. According to The Walk-Up Wake-Up Call: Atlanta by Christopher B. Leinberger, a research professor with the George Washington University School of Business, tenants of all types are willing to pay a premium for real estate located in walkable urban places. 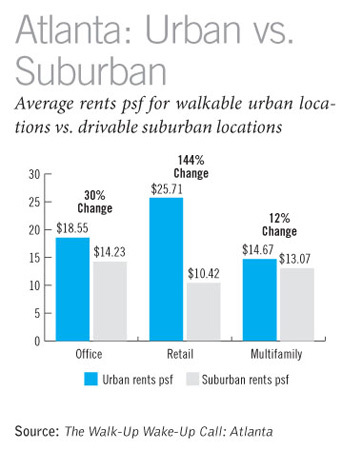 For example, in Atlanta, average rents per square foot for walkable urban locations are 112 percent higher than rents for drivable suburban areas. It’s significant that the study focuses on Atlanta because the city has long been viewed as the prototype for boundless urban sprawl, having no geographical boundaries to contain development. The study notes that, since 2009, 60 percent of new office, retail, and rental properties built in this sprawling metropolis have been located in walkable urban places. This represents a clear shift toward reanimated urban cores. Additionally, this trend is not specific to Atlanta alone, but has been noted in other cities, including Washington, D.C.
Urban locations are also seeing increased interest from intellectual property-driven companies that want to be in close proximity to other related industries and innovators, thus creating clusters. The Portman Holdings’ Makers Quarter mixed-use development in San Diego, for example, leverages the cluster attraction by creating a hub for the region’s budding design and technology cluster in a downtown former-warehouse district. Interest in the project has been significant from technology- and knowledge-focused companies seeking an area to reside for mutual benefits. Competition for technology and other knowledge industry workers is also bringing attention to education clusters, also frequently in urban settings, such as Raleigh. While urban office space may ultimately cost more on a price psf basis, corporations are beginning to view their real estate office decisions holistically and understand that they represent not a cost of doing business, but rather a tool for doing business better. Although slightly harder to define on a spreadsheet, these qualitative advantages translate into corporate quantitative benefits. Charles Pinkham is vice president of development for Portman Holdings. Contact him atcpinkham@portmanholdings.com. Travis Garland is a leasing manager at Portman Management Co. Contact him at tgarland@portmanholdings.com. The $400 million Downtown East development aims to be the “connective tissue” linking the new Minnesota Vikings stadium with downtown Minneaapolis. It used to be fairly common for wealthy real estate developers to buy sports teams. These days, owners of sports teams are turning the tables and becoming real estate developers. Case in point, Tampa Bay Lightning owner Jeff Vinik, who is championing an ambitious plan to redevelop a swath of downtown Tampa’s waterfront district stretching from the city’s convention center to the Amalie Arena to the Florida Aquarium. Vinik has proposed partnering with the city and state to build nearly 3 million square feet of commercial space on the 25 acres between Amalie Arena and the Selmon Expressway he has assembled over the last several years. The development plans, which total $1.07 billion, are being backed by Cascade Investment LLC, an investment vehicle of Microsoft founder Bill Gates. Across the country, more owners of major sports teams are pushing plans to build mixed-use projects and expanded entertainment venues on property around their venues, banking on an improving tax base and general economy along with sports fans’ demand for newer, ever more luxurious facilities. Leading the charge is a new generation of NFL stadiums. Only three pro football stadiums were built from 2008 to 2010 — Lucas Oil Stadium in Indianapolis, AT&T Stadium in Dallas and MetLife Stadium in New York — and no projects had been built since 2010 prior to last year’s opening of the $1.3 billion Levi’s Stadium in Santa Clara, CA, the new home of the San Francisco 49ers. A $1 billion stadium is under construction for the Minnesota Vikings and another five have been proposed, including a $1.4 billion facility for the Buffalo Bills, and new stadiums for the Atlanta Falcons and San Diego Chargers, each with a price tag of $1 billion. Developers have proposed two projects, each valued at up to $1.2 billion, to lure an NFL team back to Los Angeles. Last week, the city of St. Louis countered with a proposed stadium project to keep the Rams lodged in the Gateway to the West. Bill Witte, president of Related California, said the $6.5 billion City Place megaproject in Santa Clara connected with Levi Stadium “is a compelling and exciting opportunity” for place-making and delivering a world class mixed-use development. The proximity to the 49ers’ home field provides an opportunity “to create a dynamic city center in a strategic location that will itself be a new destination that better capitalizes on the area’s full potential,” Witte said. Ryan Cos.’s Downtown East project will serve the Minnesota Vikings stadium by skyway, making it “the most connected stadium in the U.S.,” company officials said. The project totals 1.2 million square feet of office in two 17-story buildings, 28,000 square feet of street level retail, and 400 residential units. “This project will serve as the connective tissue linking the downtown core to the stadium, the University of Minnesota, the Mills District and the Elliott Park neighborhood,” Ryan said. Other owners interested in commercial real estate development include Jacksonville Jaguars owner Shadid Khan, a billionaire Pakistani-American businessman who has long expressed interest in becoming master developer of the city-owned Shipyards property on Jacksonville’s downtown riverfront. Khan, who also owns English Football League team Fulham F.C. and Urbana, IL-based auto parts manufacturer Flex-N-Gate, has been involved in other real estate deals in the city. Stache Investments LLC, an investment fund headed by Khan, provided a $3 million mortgage for the acquisition of the old Barnett Bank Building, which developer Steve Atkins wants to launch a $30 million redevelopment of the property into the Barnett Bank Tower. Khan has not confirmed publicly whether he is involved in the development. While stadiums and arenas are clearly a magnet for new development opportunties, existing property owners and tenants often help foot the bill as local governments levy special assessments to pay for bond financing. For example, Cobb County will shoulder about $300 million of the Atlanta Braves’ new $672 million SunTrust Park project. While the existing tax base and in-place assessments will cover much of the public financing, a proposed new special district could add between 10 and 20 cents per square foot to operating costs for landlords and tenants, according to a Cushman & Wakefield analysis of the project’s economic impact. A 15,000-square-foot tenant in a newer building would be required to pay an additional $3,150 year under the new assessment, Cushman said. “Businesses now operating in the area will need to weigh the pros and cons of the new development to determine if remaining in place makes sense, while businesses currently located in other parts of metro Atlanta may decide that the new stadium area is where they need to be.” said Logan Menne, research manager for Cushman in Atlanta, in the report. The Braves last week released renderings of a $400 million mixed-use development planned for 57 acres next to SunTrust Park. Included are twin office buildings, retail shops, a hotel, entertainment and residential buildings — all to be ready by Opening Day in April 2017. NBA franchises are also getting a piece of the action. A hotel tower, office, retail and restaurants will highlight $250 million in ancillary development surrounding the new $477 million Sacramento Kings arena, a replacement for the NBA team’s Sleep Train Arena that supporters say will inject life into the long ailing Downtown Plaza area. Professional soccer is coming into its own in the U.S. as both a spectator sport and an economic development tool, with stadium proposals moving forward in Washington, D.C. and Indianapolis. The D.C. Council last month approved the District’s $150 million contribution toward acquiring land and building infrastructure for a $300 million Major League Soccer stadium for the D.C. United team. The 20,000 – 25,000-seat stadium will be built in the aptly named Buzzard Point in a blighted former industrial area along the Anacostia River. The team will also develop nearby property to support the new facility, with work starting next year and the venue scheduled to open in 2017. D.C. United Managing General Partner Jason Levien said the new stadium will generate jobs, economic activity and new development already starting to bud along the Anacostia waterfront. “These stadiums have made a difference in our local communities, and we certainly believe the new D.C. United Stadium will provide an enormous community benefit to the Buzzard Point neighborhood,” added MLS Commissioner Don Garber. The Indy Eleven, a North American Soccer League franchise, also hopes to develop an $82 million stadium in downtown Indianapolis. The team is asking the state legislature for help in funding the 18,500-seat venue.